Magnesium oil (magnesium chloride)is a great form of bio-available magnesium. Absorbed through the skin, it can prevent magnesium deficiency, soothe sore muscles, combat inflammation, and boost DHEA! Magnesium is a mineral that is used by your body in over 300 critical chemical reactions that are vital to your health on a day to day basis, such as synthesizing ATP for energy, and metabolizing vitamin-d. Magnesium deficiency is common in our modern society due to stress, and consuming processed foods. The lack of magnesium is not always obvious even during routine medical labwork, because doctors tend to look at magnesium levels in the blood and assume this reflects tissue levels. However, tissue magnesium, which is the most critical measure of magnesium status, is harder to determine, and does not necessarily reflect blood levels of magnesium. So magnesium deficiency is mostly undetected in the vast majority of the population. The US recommended daily allowances for magnesium is 320 mg daily for women and 400 mg daily for men. However most people fall far short of this level, putting them at risk for serious illness! Magnesium also helps balance calcium levels in your body. The ratio of calcium to magnesium should be 1:1, but in modern society with all the improper eating and stress we undergo, the ratio averages between 5:1 and 15:1. The regular use of transdermal magnesium can help achieve a healthier balance in this critical calcium to magnesium ratio! Magnesium is vitally important to your health, but what's the best way to get it into your system? Obviously the best way if possible is to get your magnesium through your daily diet, however with our modern processed foods, this becomes more and more difficult! Oral magnesium supplements can help, but these are not well absorbed, and if you take too much you end up with loose stools (diarrhea). This is where magnesium oil in the form of transdermal magnesium can solve two problems at once. It can help optimize magnesium levels in your body, and avoid upsetting your GI tract the way the oral form can. Using transdermal magnesium is very simple. You just spray it on your skin and rub it in. It is not actually an oil, but rather a very concentrated form of magnesium chloride which because of it's ability to draw moisture to your skin feels somewhat oily to the touch. It will tend to sting a bit if you use it on sensitive skin, as it is a salt of magnesium. However you can use it safely all over your body. Rubbing or massaging it in helps sooth muscles and relieve pain. Magnesium oil provides a quick, effective, and inexpensive way to get needed magnesium into your body. 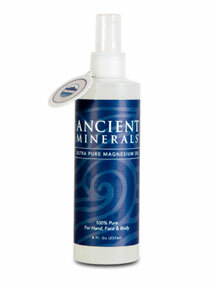 Transdermal magnesium is the latest and probably the best way of absorbing this vital mineral. Add this form of magnesium to your antiaging arsenal, lower your risk of chronic disease, and feel better right away!